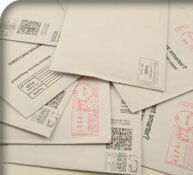 Think in terms of cost per thousand and how cheap you can send a ton of direct mail to as many people as possible. Think in terms of ROI, Cost per new client acquisition, relevance to your target audience, and deploying Best Practices Marketing Strategies: Think Symphony, our exclusive Multi-Channel Marketing software. Quantify and Measure the value of Marketing programs and investments! With Universal, we just give them our project specifications and time-line, and they do the rest. It’s almost too easy! Their experience in our industry makes them so much more than just a vendor; they really are a partner and always make us look great with our clients!